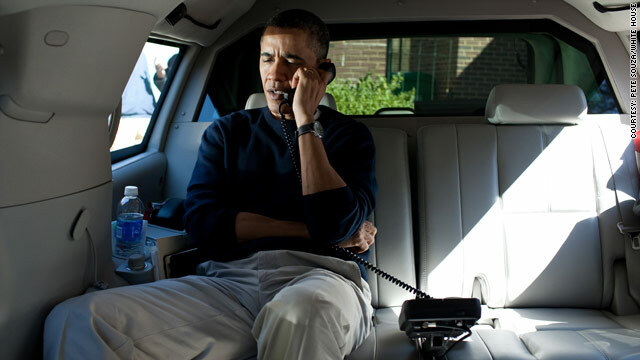 President Barack Obama talks on the phone with Afghanistan President Hamid Karzai from his vehicle on Sunday, March 11, 2012. (CNN) - Even as U.S. officials work overtime to mitigate Afghan outrage caused by the reported killing of 16 Afghan civilians by a U.S. soldier over the weekend, administration officials assert the massacre will not derail discussions on the role of U.S. troops in Afghanistan beyond 2014, when foreign combat troops are scheduled to withdraw. Citing a recent agreement by U.S. and Afghan officials on a U.S. run detention center, the official said the two countries will continue to work together even during this tense time. The ‘memorandum of understanding’ (or MOU) signed Friday details how the U.S. will hand over control to Afghan authorities of a detention center housing 3,000 people and was agreed to despite the outrage and anti-U.S. violence stemming from the apparently inadvertent burning of Korans by U.S. troops last month. The negotiation took more than a year to complete and was a key sticking point in negotiations on the role of the United States in Afghanistan. In the wake of the reported killings, the Obama administration is watching developments in Afghanistan closely in anticipation of anti-U.S. violence. U.S. ambassador to Afghanistan Ryan Crocker and U.S. military commanders, in addition to other U.S. diplomatic and military officials, are in touch with Afghan leaders, including at the local level. They are stressing how seriously the U.S. government is treating the killings, that the soldier reportedly responsible was a lone actor and that he will be held accountable for his actions. Hopefully, the Afghanis feel the same! Judy...I agree. However, that's what they do and have been doing since day one! Running their fat mouths publicly on things they don't have the slightest idea about when it comes to foreign policy, in attempts to diminish the President and to make him look weak and small to the worlda! Oh, that's been their only goal since he stepped into the Oval Office! They know what their doing alright! It's called sabotage!! They will continue to do this until an act of GOD stops them...and it's coming soon!! I find it very ironic that as soon as Obama got in office and started his world apolgy tour through the Mid-East telling all the radical leaders that we're their friends and they should reciporcate, they took his position as meaning this man has no backbone and will not stand up against us. Think not? Look what's happened in Tunisa, Egypt, Libya and Syria. None of them ever thought they could rise against the U.S. when a Republican held the office. Clinton, he had the same effect with what went on in Bosnia and so on. Now these countries are being run by the infamous Muslim Brotherhood. A group that was literally underground until Obama took his stance. ...I'm just saying.